Fishing season in Mexico’s Sea of Cortez tends to lull a bit in December. However, November is still a decent time to reel in a great catch, making the coming week a great time to fit in a last-minute trip. 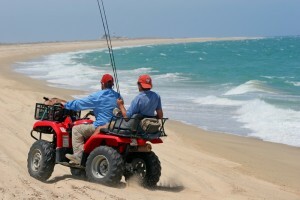 Whether you venture into Baja or head to Rocky Point, you need to make sure that your Mexican auto insurance from MexicanInsuranceStore.com is up to date. You can review your car insurance for Mexico at MexicanInsuranceStore.com to verify the term and limits, making changes or renewing as needed. Mexican auto insurance from MexicanInsuranceStore.com is now required in order to drive on any highway in Mexico. Mexican auto insurance from MexicanInsuranceStore.com is required! If you haven’t traveled to Mexico in a while, you may not be aware of the increases in liability limits. The Mexican government updated its labor law last December, increasing the death benefit dramatically on behalf of the dependants of individuals killed in third-party accidents. As a result, your obligation if you are at fault in a fatal accident can be the equivalent of 5,000 days’ wages in the state where the incident occurs. In Sonora, this is a somewhat low obligation, less than $5,000. In Baja, the amount is in excess of $160,000 per fatality. You’ll find that the cost differences for car insurance for Mexico at MexicanInsuranceStore.com are not dramatically different for higher liability limits, and it’s really worth the investment to opt for higher limits when you buy Mexican auto insurance from MexicanInsuranceStore.com. If you are thinking about saving money by taking your own boat on your journey, make sure that you don’t create unexpected costs by forgetting to add your boat to your Mexican auto insurance from MexicanInsuranceStore.com. The towing vehicle’s policy can be nullified if an accident takes place while it is towing a trailer or vehicle not listed on the policy. If you travel by RV and tow an auxiliary vehicle to get around, you will also need car insurance for Mexico at MexicanInsuranceStore.com to cover the operation of that vehicle. While Mexico doesn’t celebrate a November Thanksgiving holiday, areas that cater to American tourists can be busy. Before you go, make sure that you have some plans for where to stay. Additionally, make sure your Mexican auto insurance from MexicanInsuranceStore.com is purchased and printed so that you have proof of coverage in your possession as you travel. Mexican auto insurance from MexicanInsuranceStore.com gives you peace of mind! Mexican auto insurance can suggest good packages according to your activities that you may want to enjoy in Mexico, they can be cost effective at the same time.